Escaping from the world of mainstream crossovers is tough these days. Fortunately, for sedan fans who still appreciate the low-slung driving feel with the ample cargo, expansive interior space, and stylish looks they offer these days, are still in luck. Automakers sticking it out with lowly 4-door haulers aren’t holding back, pouring in more love and features like never before – and for the new, redesigned 2019 Nissan Altima, this couldn’t be more true. Entering its 6th-generation for 2019, the Altima has had a somewhat confusing ride since first arriving in 1993, a time when crossovers were essentially nonexistent. Nissan’s mid-size sedan started off strong with great looks and upscale feel, then lost its way with ambiguous design and watered-down identity. We’ll blame it on the emergence of the compact crossover. Fast forward to 2019, the new Altima realized it needs to step it up to compete. Adding all-wheel drive (now a standard in Canada), lighter and stronger body, more tech part of the Nissan Intelligent Mobility program, updated design with more colour choices, and improved driving dynamics are a good start. The Japanese car builder knows it needs to make an investment in the Altima to make a strong case for the sedan. Adding AWD is definitely a game-changer – now a standard in Canada. The 2019 Altima is the first all-wheel drive 4-door the brand has ever released in North America, looking to provide drivers more confidence, especially for winter driving. Nissan took things a little too far with the 2019 Altima-te AWD snow beast we got a chance to rip around in. Two decades later, the new Altima gets the biggest investment yet including a completely new platform that’s now lighter and stronger. In turn, faster with a chassis developed to offer more comfortable, controlled and confident driving experience in all trim levels. Read further below for my 2019 Altima driving impressions. In addition to the all-wheel drive traction control benefits, Nissan enhanced the Altima’s suspension with added reinforcements for better response and the first Altima application of monotube rear shocks. During the Altima’s more forgettable years, the once premium interior took a major hit with bland design and subpar materials. That’s all changed with the next-generation redesign. 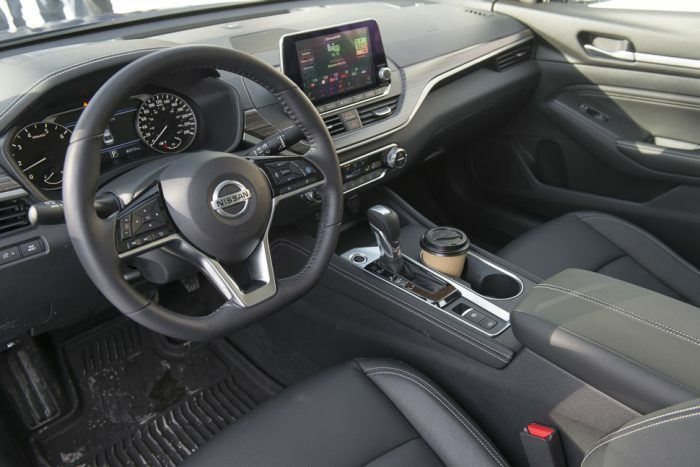 We wouldn’t say it’s a luxury interior but the Altima’s new cabin is up there and certainly ahead of the competition in the volume mid-size sedan segment. A new horizontal “gliding wing” instrument panel looks sharp with clean layout that’s now more lightweight and layered compared to the outgoing variant. The seats are improved with optional perforated leather-appointed seat inserts. Thanks to a new platform design with a lower profile engine layout, the 2019 Altima is now wider while hugging the road, adding a huge dose of athleticism missing all these years. Compared to the outgoing model (reviewed here), the new Altima grows all around, sitting 1.1 inches lower, 1 inch higher, and just under an inch wider. Styling-wise, Nissans these days typically take on a more concept-esque look with spacey design cues. It’s a unique look not for all tastes but the design certainly separates it from the pack. For 2019, the V-motion front grille carries over with a redesign, adding LED projector headlights with signature Daytime Running Lights, LED fog lights, floating roof with slim pillars and single panel moonroof. All available in 7 colours. Nissan is putting a lot of emphasis these days on their Nissan Intelligent Mobility program with technology leading to a future of more autonomous vehicles. ProPILOT Assist is one of them and now integrated into the Altima. Essentially, this tech eases driver workload by reducing the amount of driver acceleration, steering and braking input under certain driving conditions, such as single-lane highway driving. Operated by a two-button function, once ProPILOT Assist is activated and Intelligent Cruise Control is set to the right speed, the tech kicks in keeping drivers centered in the lane, navigating stop-and-go traffic, maintaining a set vehicle speed and maintaining a set distance to the vehicle ahead. The goal is to help with fatigue in annoying stop-and-go traffic while overall offering a more pleasant driving experience. All Altimas will get Apple CarPlay and Android Auto paired to the standard NissanConnectSM, and the 8-inch touchscreen display is also a standard. The seats are updated for comfort and support with optional 8-way driver’s seat with memory. Also check out What is Apple CarPlay? Optional, this system adds a bunch of new features for 2019 including over-the-air updates, door-to-door navigation, real-time Premium Traffic updates and a Bluetooth Device Manager with customization features. Canadians rejoice. These three features are standard with the 2019 Altima, and worth singling-out. On the road, the new Altima’s low profile design really shines, especially taking corners at higher speeds. The suspension’s new dampers and added reinforcements feel tighter than ever without compromising comfort. My journey took me from the Montreal airport up to the beautiful, mountainous Tremblay region a couple hours north, where a mix of city, highway, and windy roads were in play here. The torque distribution system feels good on the highway, kicking in when needed in different driver situation, whether quickly merging in city traffic or making a pass on the highway. The suspension’s new dampers and added reinforcements feel tighter than ever without compromising comfort. Powered by a new 2.5L DOHC inline 4-cylinder direct injection engine, Nissan worked hard improving the Altima’s powertrain, employing a whopping 80% of new or redesigned parts versus the outgoing model. The 182-hp is adequate, along with the Altima’s 178 lb-ft of torque. Everything works with Nissan’s new Xtronic transmission with an updated expanded lock-up area for improved efficiency. Takeaway: Should you Buy a 2019 Altima AWD? This may come as a shocker to most but not everyone out there desires or necessarily needs a crossover. Sedans are offer terrific cargo space especially with rear seats down, loads of interior cabin space, and unrivalled performance you won’t find with small utility vehicles (yes, fun driving is still a thing). The 2019 Altima has gotten a lot of long overdue love and attention, and we’re happy to see that. Adding all-wheel drive – their first North American sedan to do so and making it a standard in Canada – is a major change to help elevate the 4-door status it deserves. In the US, the Altima options are plentiful with a front-wheel and all-wheel drive varieties, starting at about $24k for the entry-level FWD model, topping out at the late availability Edition ONE VC-Turbo at nearly $36k which adds a bunch of sportier features including 19″ Dark gray aluminum-alloy wheels. In Canada, all four trim grades are AWD only, starting at $28k for the S and topping out with the Edition ONE at $36k. All prices below are MSRP and exclude any fees/charges – check your local area for exact prices.